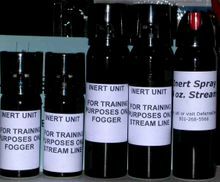 Inert Pepper Spray for training purposes in the most popular can sizes. Practice pepper spray aiming and shooting with the same cans used for real pepper spray. Use these inert sprays to get the feel of spraying your pepper spray without the pepper spray effects. If you can hit your target with these, you will be successful using pepper spray on an attacker. Contents are just plain, uncolored water in pressurized spray cans. Comes in 2 oz. stream patterns and now available in the Red output. The red is just water dyed red. It may stain clothing etc. Now available in Flip Top in the 2 oz size. All models are stream spray pattern only.